A local nurse, convicted last year after a third trial of killing a 20-year-old college student and scattering her body parts in Trumbull, is now being represented by his fourth lawyer. Attorney Norman Pattis filed paperwork in Superior Court here to represent Jermain Richards in his appeal on Wednesday. “I think he has excellent prospects on appeal,” Pattis said as he left the Fairfield County Courthouse. Richards, a private-duty nurse, was found guilty of murder last September in the death of Alyssia Marie Wiley, of West Haven. He was sentenced to 60 years in prison. On April 19, 2013, the Eastern Connecticut State University sophomore disappeared after leaving the Willimantic campus in Richards’ car. After a statewide search, Wiley’s grisly, partial remains were found 27 days later in the woods at the end of Quarry Road in Trumbull, a mile and a half from Richards’ Bridgeport home. Two juries deadlocked on a verdict in the case before a third found Richards guilty of killing Wiley. Richards had a different private lawyer in each case. 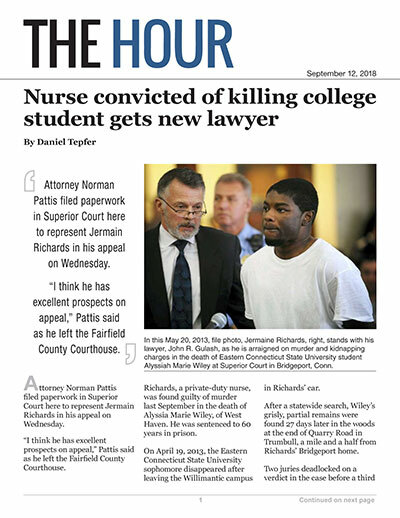 Pattis told Superior Court Judge Robert Devlin on Wednesday that Richards’ mother had hired him for the appeal.